Final school concerts, awards assemblies, graduation ceremonies… chances are your family calendar is dotted with these events over the next week or so (maybe longer, if you’re making up lots of snow days, ugh!). Along with these milestones and rites of passage, come lots of welcome changes but also bittersweet moments for us as parents. We thought it was the perfect time to revisit Jennifer (Smith) Schuler’s blog post “Saying Goodbye to the Baby Years.” Sniff…. When you are only able to have one child (for whatever reason), simply put–you treasure him extra much. It’s not that I love my child more than anyone else loves theirs, it’s just that there is no little one coming behind him as a distraction from my sadness at seeing him grow up and move forward in his life. I think I just hold him a little tighter sometimes because of that. I have always relished snuggle time with my little boy. This fall is going to be so incredibly difficult for me because I do not want to let my “baby” go. Although I was able to stay home with him and have a lot of quality time together, I don’t think parents ever feel as though they have had enough time for that. And no matter how hard you try to slow time down, it still won’t stop. 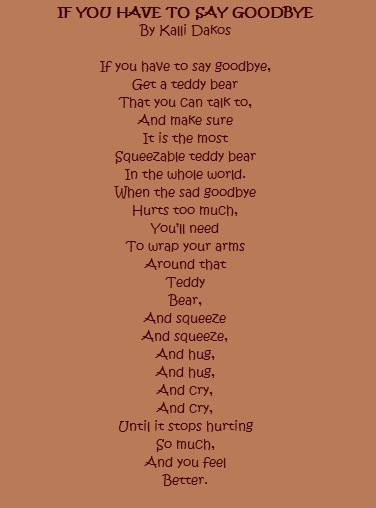 Kalli Dakos’ “goodbye poems” can bring comfort to children and their parents during difficult times of loss and change. Still, I can’t freeze my son in time. This fall, he is beginning a Pre-K program at a private school where he will attend through 12th grade. Don’t get me wrong – we found an amazing school that incorporates all the educational and personal philosophies we want for our little boy. Once we looked at the benefits to our son having a whole-child education in a smaller classroom and campus environment, it was a no-brainer. My son’s new school also offered a 5 full day summer camp program with different weekly themes. What a great way for him to adjust to his new school in such a fun way! Perhaps the fall, then, would be less of a shock. We chose two sessions separated by a week between. The beginning of the first week was somewhat hard for my son to acclimate to, especially the first day. He was in a new environment and experiencing a rather long day even though rest and quiet time was built in. After a couple of days, he adjusted fine yet every once in awhile he would fuss at morning drop off–wanting me to walk him to his group’s classroom meeting place instead of going through the carpool line. I was so torn in these situations. I knew that having him become comfortable with this drop off routine would benefit him for the fall, yet he is still so young and I didn’t want to force him nor upset the start of his day. I decided to go easy and help him adjust slowly over a two week camp experience. After the two weeks we had an opportunity to enroll him in the final two weeks of camp, and he was very excited! He had done it. He had successfully adjusted, and enjoyed his time at camp and on the school campus! This Monday, drop off was a snap…for my son. It was me who did not fair so well. Sigh…aren’t you going to miss me? Luckily my fellow blogger, Chris, wrote a wonderful piece on adjusting to the “emptying nest” and I found her tips applicable to my situation too. Her blog also offered fresh perspective on what these early years have really been about – and they weren’t always easy for sure! Let me add a few suggestions for those of us sending young children off to Pre-K or kindergarten this fall. We can do this! * Pack plenty of tissues! Don’t leave home for that first day of school without them, or walk your child to the bus stop without a wad stuffed in your pocket. * Try hard to wait to cry when your child is out of sight. This is something I likely will not achieve, yet it is a noble goal. I am pro showing-your-feelings-in-front-of your-children (within reason), yet at such a young age kids sometimes still confuse emotions. And, you really can’t explain “bittersweet” to them. The more cheerful, upbeat and excited you are, the more likely they will follow suit in their responses to going off to school. * Establish sacred alone time. Carve out time for just you and your child amidst the busy school week in any way you can. Sneak in a moment of reading time cuddled up on the couch, sing songs while your child sits in the bathtub, listen to their school experiences while you’re cooking dinner. You don’t have to spend large blocks of time staring into your child’s eyes to have spent quality time together. * Use weekends for “regrouping.” Spend some quality family time together – better if it doesn’t involve big plans or a lot of running around since the school week will have held plenty of that. Just be together. * Make your child’s bedroom a haven. No matter how much money you have to spend on your child’s bedroom design, there are many things you can do inexpensively to keep their room current to their age-specific interests. It also doesn’t take a lot of effort to keep it organized and clutter-free. If your child has a clean, calm place to retreat to for quiet rest, reading and play he will know where he can go to relax and recharge his energy. * Get involved in your child’s education. There are many ways to do this, even for busy working parents. If you can’t volunteer in your child’s classroom or serve on the PTA, you may be able to take off a day from work to go on a field trip or offer to prepare learning materials at home. You are supporting your child’s learning experience as you sit down together to review homework assignments and prepare for the next school day. * No matter how many children you have…You’ll always be sad when they leave the “nest.” There are many phases of your child’s life. You will say goodbye to them all. 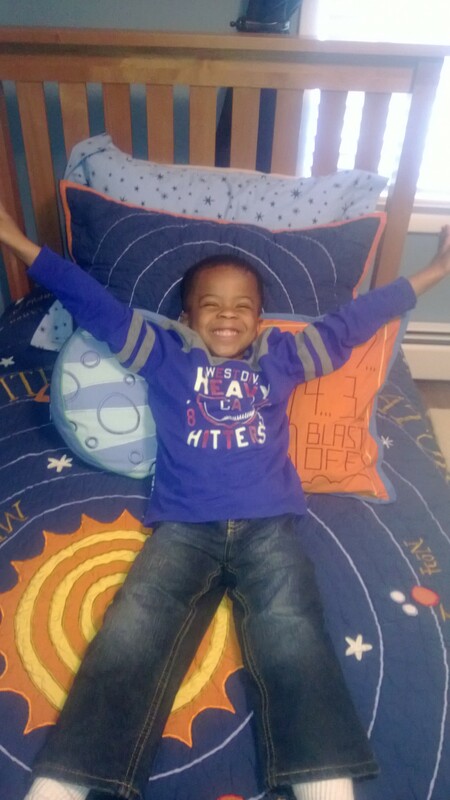 One morning, I went into my son’s room to make up his bed with clean sheets. As I smoothed out the covers and neatly arranged his soft pillows, I realized that although he seems to be growing up more every day he still needs me. And in one respect or another he always will. 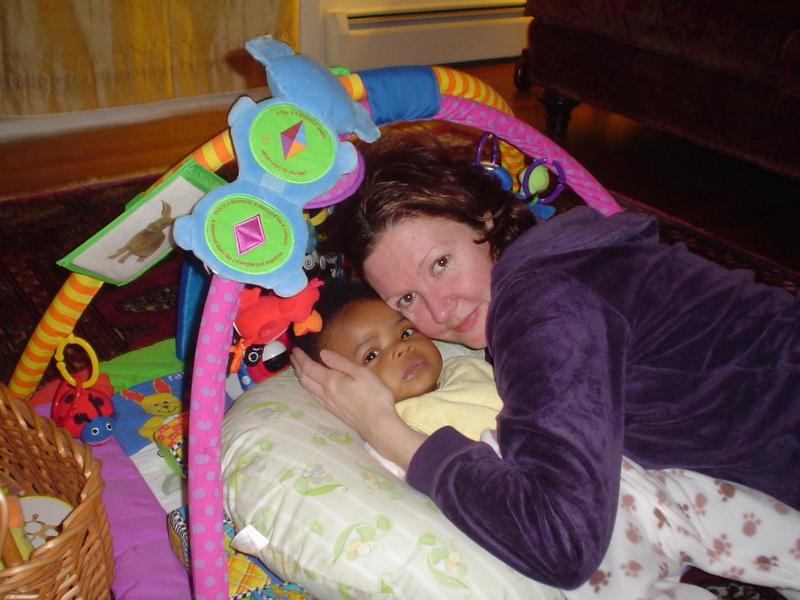 So I might be saying goodbye to my son’s “baby” years, yet he will always be my baby. No matter how old my son gets, I will never stop holding him and rejoicing in who he is becoming. What was it like for you saying goodbye to the baby years? Did you find some ways of coping that we can all benefit from? If so, please share them with our OTMGR community!